In a very surprising, but incredibly welcome decision, the Court refused to hear an appeal by Dupont, GE and others, in the two-decades old case brought by thousands of sick people exposed to radiation during A- bomb tests beginning in the 1940s. The companies were arguing that they should get immunity. No dice. Now, the victims may have a chance of a meaningful global settlement. Then, the Court sent back to a lower court (i.e., kept it alive) a lawsuit by four British citizens detained at Guantanamo who sued former Defense Secretary Donald H. Rumsfeld and other Pentagon officials for torture and the denial of their religious rights. No automatic immunity for these guys either! Lately, the news has been loaded with articles (see here, here, and here) about civil lawsuits expected – with the first one already filed – as investors try to recover their losses from the infamous Bernard L. Madoff $50 billion “ponzi scheme,” which ensnared New Jersey Senator Frank Lautenberg, Daily News Publisher Mort Zuckerman and Mets Owner Fred Wilpon, among countless others. Anywho, now he’s the one running to court. But don’t get us wrong. Just because someone says something “inartful” about lawsuits doesn’t mean he can’t see the light, have a change of heart. Everyone’s doing it. In fact, we hope Senator Chuck Schumer (D-NY) does it too, and soon. As the New York Times wrote over the weekend, Schumer has been a “champion of Wall Street.” But that means that he has been busy trying to deregulate (and we know now what a big mistake that was!) as well as seeking severe limits on lawsuits by defrauded investors. In the 1990s, he even pushed one bill over President Clinton’s veto. That law, the Private Securities Litigation Reform Act of 1995 and its sister, Securities Litigation Uniform Standards Act in 1998, both aimed at curtailing lawsuits by injured investors in securities fraud claims, were bad laws and should be repealed. In a closely-watched preemption (i.e. corporate immunity) case that we've blogged about, the U.S. Supreme Court today allowed a case about the deceptive marketing of “light” cigarettes to go forward under Maine’s unfair trade practices law. Fantastic victory here, and while it shouldn’t have been close, it sure was (5 to 4)! And the court ruled only on the preemption claim, not on the merits. But, phew! We’ve been writing a lot lately about incompetent doctors and hospitals (see here, here, here, and here), but in civil justice terms, this may be the greatest medical story ever told. Even worse, not long after this exchange, false accusations about Martinucci started to fly. “Among the defamatory remarks falsely attributed to Martinucci were that he wanted to fire all black employees in his department; that he did not like it when blacks dyed their hair certain colors; that Filipinos were dumb as a box of rocks and that Salvadorans have nice legs, but are not very smart.” Eventually Martinucci resigned under the threat of being fired. And where do you think the good doctor turned to remedy this terrible injustice? You guessed it, civil justice fans! Dr. Martinucci ran straight to the courthouse—suing Kaiser for wrongful termination, failure to promote, and defamation. (Funny how doctors generally tremble at the word “lawsuit,” but undergo miraculous conversions when they’re the ones who get hurt!) In the end, Martinucci was victorious on all counts, collecting both compensatory and punitive damages from Kaiser. Hallelujah civil justice! And an extra-special special amen to its latest convert, Dr. Michael Martinucci! In response, Iqbal didn’t just sue the guards or the prison officials responsible for this illegal abuse or the agents who arrested him on unconstitutional grounds. He sued former Attorney General John Ashcroft and FBI director Robert S. Mueller III, for creating, implementing and condoning what went on. Now, there are not a lot of options for those abused by the government in this fashion and normally government officials can’t be sued for doing things that are within the scope of their official positions. But they are not allowed to do things that are illegal or unconstitutional. (Although Richard Nixon, and I’m guessing Rob Blagojevich may disagree on that.) But in this case, the New York lower courts did agree – and so, they’re in the U.S. Supreme Court battling this out. Meanwhile, thousands of sick and dying ground zero workers finally have a trial date, at least for the first 50 or 60 representing a cross-section of illnesses. Let’s hope there’s some justice left for them. And the Honorable Mention Award Goes to…University Hospital! Yesterday we gave creepy “Dr. Robert S. Lai” the “Say Whaaat?” award for, among other things, inadvertently perforating a woman’s colon and refusing to admit that his slip of the knife was in any way negligent. Today, honorable mention must also be given to University Hospital in Syracuse, NY where Dr. Lai carried out his handy work, as well as other dangerous hospitals throughout the state and country. As loyal readers of ThePopTort are well aware, hospital safety and patients’ rights are a big deal to us—especially in New York State because, well, we live in New York State! In fact, last March, we traveled to Albany with other advocates hoping to persuade New York lawmakers to improve hospital safety and not take away the legal rights of patients. Add to this a new problem covered today in the New York Times, about more and more people going to the emergency room for primary care because of the dismal state of health insurance in his country. And guess what? IOM also found that the ER is the place in the hospital where most negligence occurs. With respect to University Hospital, its slogan may be, “The best care. When you need it most,” but its track record suggests anything but. Among other things, State Health Department reports discuss an infant who was discharged prematurely after surgery, only to return in less than 48 hours with kidney failure, and another report showing more than one surgery done on the wrong body part(!). It’s been awhile since we handed out one of our rare yet esteemed "Say Whaaaat?" Awards. But we read something in the New York Times today and we couldn't let it pass. So our next (drum roll please) "Say Whaaaat?" Award in the history of the Pop Tort goes to - Dr. Robert S. Lai, formerly of Syracuse, NY and now working outside Chicago. Seems that, according to the Times, in March 2004, a woman named Sharon Yacketta walked into University Hospital in Syracuse, NY for an operation to help correct her incontinence. Enter Dr. Lai, who managed to bungle the procedure so badly that he caused urine to begin leaking into Yacketta’s abdomen. As an encore, during a follow-up operation, Dr. Lai and a colleague managed to perforate Yacketta’s colon. Four years and 20 operations later, Ms. Yacketta has now lost most of her colon and is still incontinent. But that's not why we're honoring Dr. Lai. He wins because, according to the Times, he refused to call his actions "negligent." Just one of those “accidents,” he says. More on the state of hospital (un)safety tomorrow. 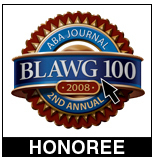 We are incredibly proud to say that the editors of the ABA Journal have selected ThePopTort.com, as one of the 100 Best Legal Blogs in the country! In its first year! There are some big campaigns going to make THEIR blog (even one anti-civil justice blog) the top legal blog. Because this is America, afterall. Everyone wants to be #1 - and so do we! So please vote for ThePopTort.com to make us the #1 legal blog! 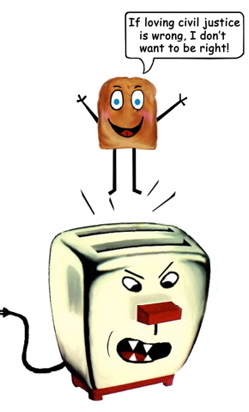 "It’s not just because the name reminds us of those tasty toaster treats that we like this blog. The Pop Tort takes a witty, clever and irresistibly irreverent ap­proach to otherwise weighty consumer advocacy issues. Launched in January, it’s also the Center for Justice & Democracy’s latest riposte to the tort reform movement." "New legal blogs are springing up on a daily basis – we now have more than 2,000 in our online directory. Competition for the time and attention of lawyers is getting fiercer," says Edward A. Adams, the Journal’s editor and publisher. "Half the blogs on last year’s inaugural Blawg 100 list didn’t make the cut this year. That’s a testament to the quality of this year’s honorees, and evidence of the increasing amount of valuable information all legal blogs are publishing." Thanks very much, Mr. Adams! There are days when the news leaves you wondering why you bothered to get out of bed in the morning —unfortunately, civil justice fans, today is one of those days. First, a terrible Workers' Comp tale…In March 2006, Taneka Talley of Fairfield, CA, a full time employee at a store called the “Dollar Tree” was stabbed to death while on the job. The killer was a guy named Tommy Joe Thompson, a stranger to Talley, who has since admitted that the only reason he stabbed her was because she was African American. Talley left behind an 11-year-old son who is now being cared for by Talley’s surviving mother, Carol Frazier, who is also the child’s grandmother. To support her grandchild, Frazier desperately needs the $250,000 death benefit her daughter is owed through Workers’ Comp, given that she was killed while on the job. Unfortunately, the Dollar Tree and its insurer, Specialty Risk Services, are denying payment of the benefit. Why? Because California’s Workers' Compensation law “doesn’t consider an on-the-job injury to be work-related if the motives were entirely personal—for example, if an estranged lover or spouse comes to the workplace and attacks an employee because of a private grudge.” According to the attorney for the insurance company, Kelly Hamilton, denial of the death benefit is proper because Thompson’s motivation in killing Talley was “purely race motivated,” and therefore, purely "personal." Reportedly, the matter is currently being debated before a state appeals board that hears workers’ compensation disputes, but may eventually be headed to court. “This case is important not only because of the injustice to the survivors of Taneka Talley. All Californians should be concerned about the precedent this case would create for workplace deaths and injuries.” Stay tuned. "Selling millions of toxic toys to kids is not the way to dispose of them, as the law clearly states," said David Arkush, director of Public Citizen’s Congress Watch division which, along with NRDC, was heavily involved in lobbying Congress for stronger product safety rules. "It’s not only immoral - it’s illegal. It is horrifying that the federal agency charged with protecting consumers is telling the industry it can dump chemical waste on toy-store shelves."